Mucking around trying out the new 40k rules, seeing as they are free and simple (for example, and example), and rumour has it the basic rules are going to be free download like Age of Sigmar perhaps. I used to have quite a few 40k figures but sold them all many years ago. All I have left is these marine and alien figures which are from the Space Hulk box set. But good enough to try the rules out! (Terrain is for 6mm as I have a game of Epic later tonight and couldn't be bothered changing it, slack I know). And away we go. I started the marines in the centre of the board, and randomised which side of the table the bugs would come on, and gave marines first turn. 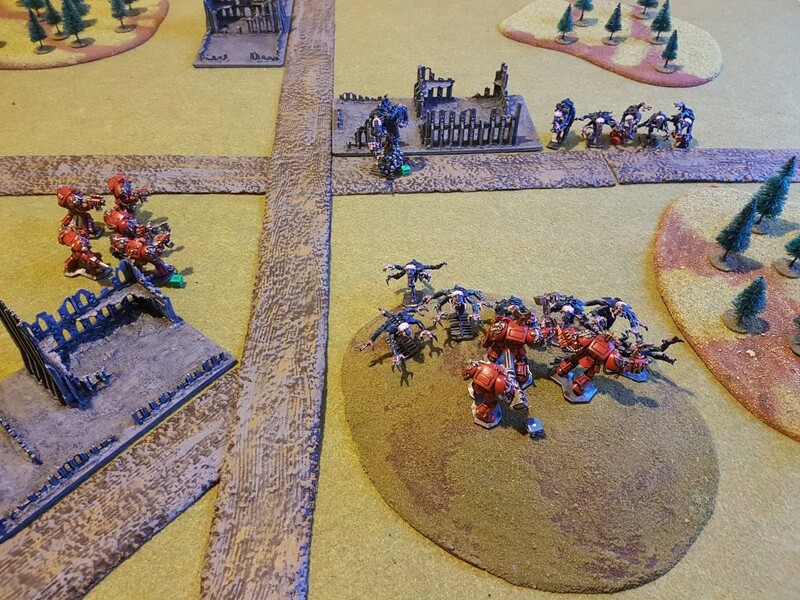 After terrible initial shooting from the marines, and cunning use of cover by the bugs, the bugs had made it to charge range. 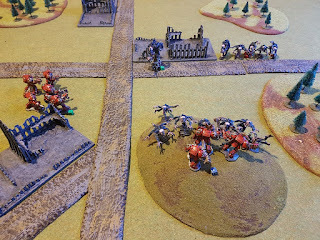 Here's the end of third marine turn. Squad Alpha had just killed off 4 genestealers in close combat in the bug turn for the loss of only one wound (Terminators have 2 each). 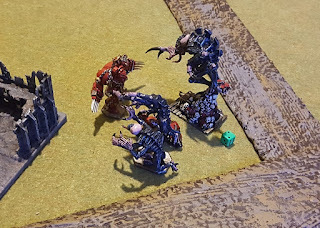 They move to make the Patriarch the closest target and shoot, doing 3 wounds to it (it has 6 wounds total, and Genestealers have 1 wound each). Squad Beta has lost two troopers and has one trooper wounded, and has killed 3 of the 9 bugs that had charged it. 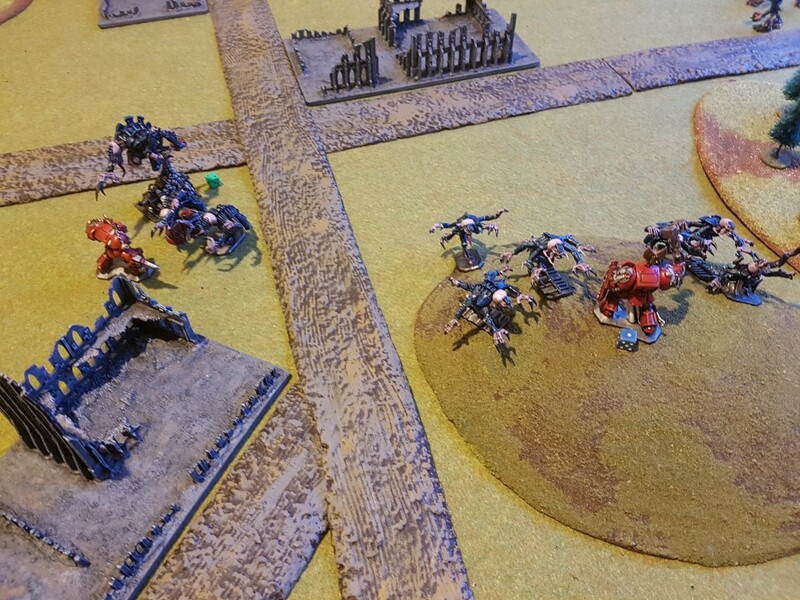 Squad Beta kills one genestealer and again just the sergeant survives. Surprisingly entertaining for such a small game, which took about 30 minutes. The new rules seem similar in style to Age of Sigmar, with only about 8 pages of rules. While I wasn't a fan of that system for the fantasy genre where I prefer ranked units, it suits the 40k setting I think. Definitely easy on the brain (unlike the previous edition as I understand it). After the game I also remembered I had forgotten the 'rapid fire' ability on Alpha squad's stormbolters (doubles their fire power at half range! ), which may have changed the outcome of their shooting at the Patriarch significantly! A couple of questions I had at the end of this, which are likely covered somewhere I didn't notice, I'll post them and someone can help me out I expect. You can only only shoot a character in the shooting phase if they are the closest target. But what about in the charge phase with overwatch fire if characters charge you? (You fire all your guns with overwatch fire but need 6's to hit rather than your usual to hit number). I presume you always get to shoot at characters charging you in this phase as it is not the shooting phase? Heavy flamers always hit (causing D6 hits), but what about overwatch fire? Do they always hit again in overwatch fire or do they need 6's to hit? I remember those pieces. They're gorgeous!